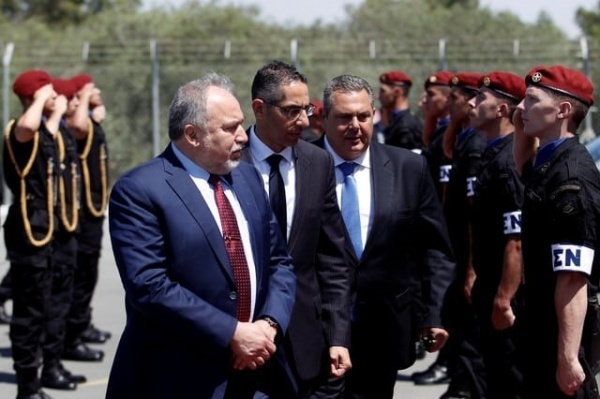 Israeli Defense Minister Avigdor Lieberman advanced a plan to build a port for Gaza in Cyprus, when he was on the island to attend the recent trilateral defense summit, the Jerusalem Post is reporting, citing a TV report. The Israeli embassy in Nicosia said on Tuesday it had no comment to make on the report. “Lieberman’s Cyprus port plan would include construction of a special pier for cargo ships carrying goods destined for Gaza. They would be checked with the help of an Israeli monitoring mechanism to ensure that no weapons were being smuggled into the Hamas-controlled area,” the Jerusalem Post said. After that, it added, they would likely be sent to Gaza directly by ferry, given that the enclave lacks a port large enough for the docking of cargo ships. Citing Channel 2, the newspaper said the principles of the plan were agreed between Lieberman and Cypriot Defense Minister Savvas Angelides during the summit on Friday. Within two weeks, work would begin on a detailed plan that would be presented within three months. “But any such move would be conditioned on Hamas’ agreement to return the remains of two Israeli soldiers and to release the three Israeli civilians believed to be held captive in Gaza,” the Post said. It then cited former Intelligence Ministry director-general and former Mossad deputy director Ram Ben-Barak tweeting that the plan would help Gaza residents without harming Israel’s security. Lieberman’s office neither confirmed nor denied the report, it added. “It did say that Lieberman and the defense establishment were working with the international community on plans to change Gaza’s reality”. “We cannot release any details beyond that,” his office said. Israel controls two land crossings into Gaza and Egypt controls a third. But it is reported that the Egyptian crossing at Rafah is often closed and is not designed for the passage of goods and that most commercial and humanitarian goods bound for Gaza enter through Israel’s Kerem Shalom crossing. The Cypriot defense ministry has not commented as yet.